Raisins are a healthful treat that when taken in moderation can reduce your risk of heart disease, says an article in the June 2013 issue of "Journal of Food Medicine." For some people, however, eating raisins can lead to intestinal gas, which can be both uncomfortable and embarrassing. Reducing the amount of raisins you eat can usually help. If you still experience gas after making adjustments, or experience gas along with other intestinal issues, it could the sign of a bowel disorder. Consult a doctor if this is the case. Having gas in your intestines is not typically a cause for concern. The gas usually dissipates after flatulence -- passing gas -- or having a bowel movement. In most cases, intestinal gas is due to either swallowing a lot of air, which can happen for several reasons, or as the natural result of bacteria breaking down food in the large intestine. Some foods, such as beans or foods high in fiber, don't fully digest in the small intestine, so they get passed down to the large intestine where bacteria break them down as much as they can. This can produce a lot of gas, which can result in belching, bloating, flatulence or abdominal cramps. Raisins, along with bananas, apple juice and grape juice, tend to create intestinal gas, according to the authors of "The New Oxford Book of Food Plants." This is because raisins are high in sugar and fiber. One cup of raisins contains approximately 98 grams of sugar and 6.4 grams of fiber, according to the U.S. Department of Agriculture. The sugar in raisins are mostly glucose and fructose, the latter of which is a common cause of gas in people who are fructose intolerant. If you are not used to consuming fiber, eating too much too quickly can cause also cause intestinal gas. One cup of raisins contains about 30 percent of the recommended dietary allowance for fiber. 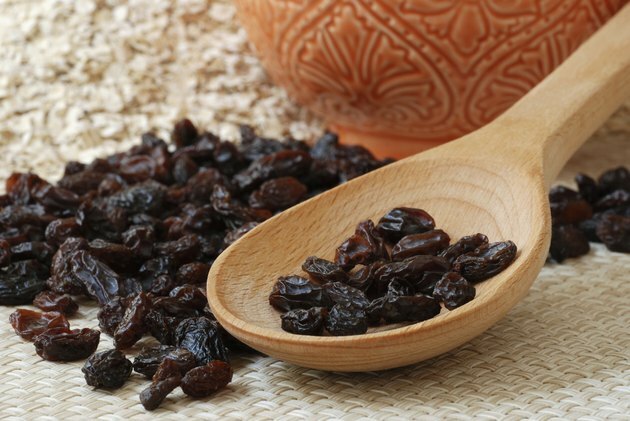 If you experience gas after consuming raisins, avoiding them completely is the best and easiest solution. Raisins can be healthy in moderation, however, so eating a smaller portion might help give you the benefits without creating problematic intestinal gas. If you can't do without raisins, taking a supplement that reduces gas in your intestines -- such as one that contains simethicone -- after or before you eat may also help. Experiencing gas when eating certain foods is a common experience, but gas that is persistent or is accompanied by other symptoms -- such as bloating, diarrhea or abdominal cramping -- could indicate an underlying medical disorder. Several digestive disorders, including irritable bowel syndrome, ulcers and Crohn's disease, can have intestinal gas a symptom. Eating raisins may just exacerbate the symptoms of the disease, particularly if you consume them with other foods that cause gas, such as a cereal high in fiber. Consult a doctor if you suspect a digestive disorder. Are Raisins Really Good for You? Do Bananas Give You Gas or Constipation? What Are the Benefits of Eating Raisins Every Day? Are Raisins Dangerous for Children? Do Almonds Create Intestinal Gas?